Advance MFF Whey Protein 80 is a researched advance form of protein which is designed to help you achieve your muscle building and fitness goal in much better way. Better recovery with 5.6gm BCAA, 4.2gm Glutamine, 12.2 gm EAA’s in Vanilla Creme Flavor. Now buy MFF products on EMI. Pay by EMI option is available on checkout by selecting 'PAY BY EMI' option. Minimum order value to avail this offer is 500. 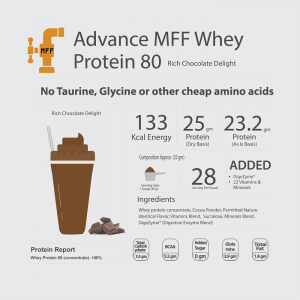 What is Advance MFF Whey Protein 80? High quality protein sourced from fresh grass fed cow milk. Contains Digezyme® latest Digestive Enzymes Technology. This digestion technology helps in faster digestion and absorption of protein in the body. Fast digestion and absorption help in faster repair and growth of muscles in the body. Contains 22 Vitamins and Minerals which are very important for the growth, energy production, repair cellular damage and many other benefits helping you achieve better fitness goals. No Sugar, No Aspartame, No Dairy whitener, No Soy Protein, No Skimmed Milk powder. Please check our nutrition table to see details of Protein and Amino acids. --> Provides 25gm Protein on “Dry Basis” in every scoop of protein. --> Provides 23.2 gm Protein on “As Is” basis in every scoop of protein. --> Provides 27 gm Protein on “Dry Basis” in every scoop of protein. --> Provides 25 gm Protein on “As Is” basis in every scoop of protein. This is not just the general Enzymes but a unique and researched combination of Gluten Free & GMO-Free Multi Enzyme Blend including amylase, lactase, cellulase, lipase, and protease. These enzymes not only help in better digestion removing the bloated feeling but also helps by making sure that the overall protein content gets absorbed more quickly so as to get quick benefits and better utilization. Added 22 Vitamins and Minerals. Vitamins and minerals play very important in helping you achieve better fitness level. They are considered essential nutrients as they play hundreds of important role in the body. Due to work-out, the need of these vitamins and minerals increases for many reasons such as getting oxygen to tissues, energy production from carbohydrate and fat, protecting from infections and damage to body cells, etc. There are many such important roles which help improve the overall workout and fitness. Vitamins and Minerals added in Advance MFF Whey Protein 80 have gone through many stages of research to understand the body requirement during different stages of the workout. Advance MFF Whey Protein 80 provides good source naturally occurring BCAA. BCAA is the combination of Leucine, Iso- Leucine and Valine which helps in enhancement of protein synthesis. Protein synthesis is a defined process in which muscle use protein so as to repair and regrow. Some research shows Leucine to increase protein synthesis by 33% i.e this helps to increase the quality muscle mass. Educating our customers is always our priority. 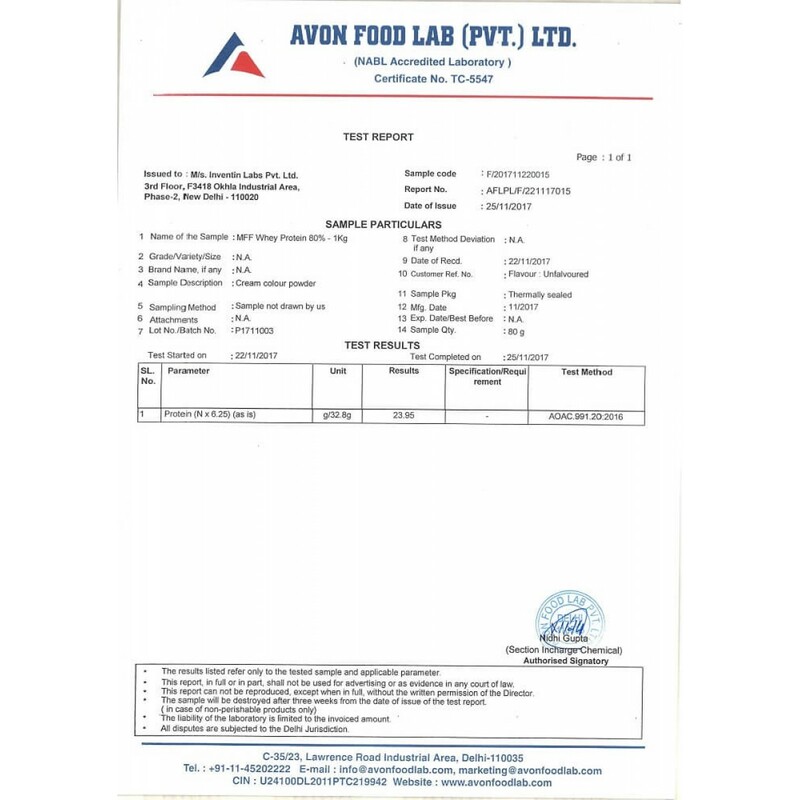 Like in Indian Sports & Fitness Nutrition market we were the first one to bring 100% Transparency and in the same way we are the first to bring better education for our customer when it comes to the difference between Protein calculation on “Dry basis” vs “As in Basis”. MFF Creatine Monohydrate 200 mesh- Finest 200 mesh quality creatine which helps in to maximize strength and power for high-intensity workout. MFF BCAA 5000– Pure 2:1:1 BCAA with almost 2500mg Leucine per serving. It Encourages muscle growth, muscle recovery and prevents muscle breakdown. What makes MyFitFuel Advance MFF Whey Protein 80 Best in India? Quality- That’s our biggest priority. We never compromise in quality of our products and our products quality is what we bet on. 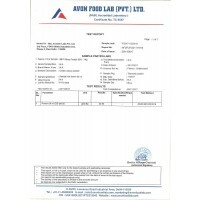 100% Transparency- We believe it’s your right to learn about the products actual benefits and its worth before you buy Advance MFF Whey Protein 80 online in India. 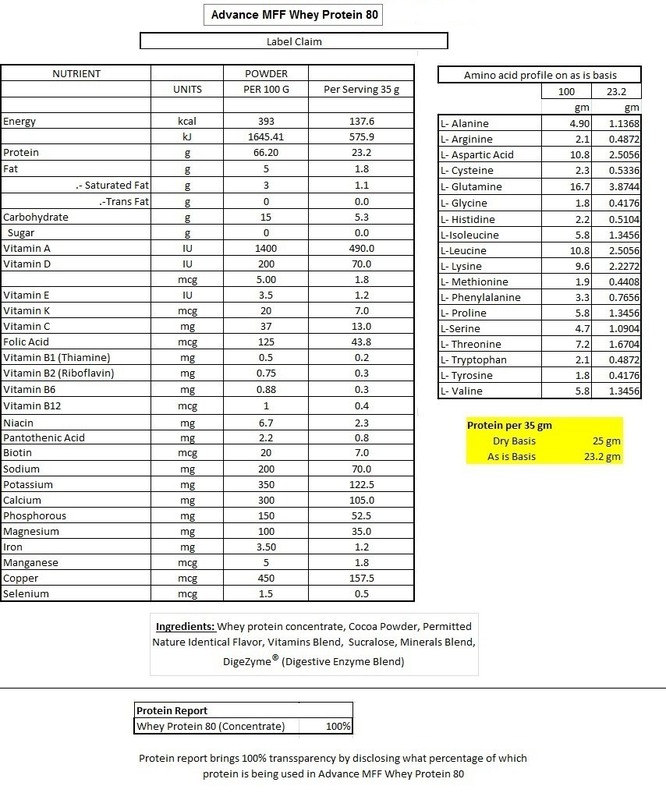 Many companies never disclose right percentage of protein used in the product, helping them to hide the actual worth and benefits of the product.We provide complete information in our “Protein Insight” by telling you which protein we use before you buy Advance whey protein concentrate from us. Our transparency also helps you to always know the price you are paying us is it the right Advance MFF 80% whey protein concentrate price. Pour 200-250ml of water in blender like MFF™ Blender and add 1 scoop of Advance MFF Whey Protein 80™. Shake the blender for 15-20 seconds and consume immediately. Use less liquid for thicker tasting taste. We recommend 2-5 servings daily to complete your protein intake. To promote lean muscles, experts suggests 1g of protein per pound body weight everyday (2.2g per kg of body weight everyday) consumed during a different time of the day. --> Immediately upon waking up in morning. --> Any other time during the day or in between meals during snacks time when you require additional protein intake. Benefits of taking with Water- Taking Advance MFF Whey Protein 80™ with water helps you to get better Lean Muscles as it reduces the overall calorie intake from your protein shake when compared to taking with milk. Any individual following the weight loss program with restricted calories intake, it is recommended to consume it in water. Benefits of consuming it with toned or double toned milk- Adding milk with Advance MFF Whey Protein helps to make the shake more creamier and thicker. But 250 ml of toned milk will also add additional almost approx. 150 extra calories in every shake. So, if your goal is to bulk up or to also increase overall weight then taking protein shake with milk will always be recommended. Although we have detailed research- Protein University wrote for you but there was few small question we summarized here. 1. How is Advance MFF Whey Protein 80 different from MFF Whey Protein 80? Advance MFF Whey Protein 80 is designed to help you provide the better digestion and absorption of protein. It is added with Digezyme® with latest advance enzymes technology helping in better absorption of nutrients providing better benefit. It also contains 22 Vitamins and Minerals which helps in better recovery by fulfilling all the required vitamins and minerals in the body. The need of these vitamins and minerals increases when we workout. Whereas MFF Whey Protein 80 is made up of just pure whey protein concentrate 80%. 2. What does MFF Whey Protein 80 concentrate actually do? Every scoop of whey protein concentrate 80 contains 80% protein quantity by volume which helps different sports players, athletes, and bodybuilders to continuously repair and grow their broken muscles tissues. Remaining 20% contains lactose, vitamins and minerals and a small quantity of Fat. All these nutrients including protein help in better recovery of the muscles specially during post workout period. 3. When Should I take Advance MFF Whey Protein 80™? The timing of taking protein depends on the lifestyle and the fitness goals of an individual. Some individuals train in the morning and some train in evening but we recommend following important serving times of Advance MFF whey protein 80. --> Immediately after you work out i.e post workout. --> Or any other time during the day or in between meals when you require additional protein intake. 4. Why should I take protein? Protein naturally plays very important role for repair and re-growth of your muscles tissues. If we keep this in very simple words, so to increase the muscle mass strength athletes, bodybuilders or any individual into fitness needs protein and to stop over training endurance athletes need the right amount of protein for muscular repair. Ultimately all bodybuilders, athlete, and individuals into fitness need protein to help them cope with the continuous demands of heavy training and growing competition. 5. Is Advance MFF Whey Protein 80™ suitable for vegetarians? Whey protein is made from pure milk and it is considered as a vegetarian source of protein. 6. How can I tell if protein I am using is of good quality or not? 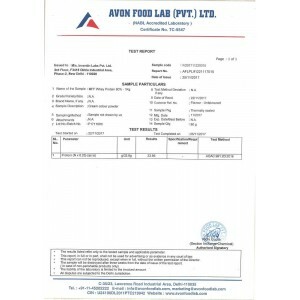 Many companies declare in label something different from what’s actually there inside there packet but in our “Protein Report” Section on product page we always declare which proteins are there inside the product (i.e nothing hidden) One of the basic and important key sign which everyone should look for is the level of protein declared on the label. Protein should also be easy to mix and with little froth. And of course the another ultimate way to know is from the results you get from taking the product for some time. 7. Can I take Advance MFF Whey Protein 80™ with any other supplement? Yes, you can take it with any other supplement with Advance MFF Whey Protein 80. You can increase your workout benefit when you take it with most commonly used supplements with whey protein like Creatine Monohydrate 200 Mesh, MFF BCAA 5000 (Branched Chain Amino Acids) and Glutamine. We always recommend you to check the serving instructions on each additional product you plan to take as a combination with this product. 8. How do I make perfect whey protein shake with Advance MFF Whey Protein 80™? It is very easy to make a perfect shake from this Advance MFF Whey Protein. All you need to do it follow few simple steps. Take good blender like MFF™ Blender, pour approx. 200-250ml of liquid in the blender first. Adding milk will help you to bring creamier shake but adding water will help you to avoid intake of extra fat that comes from milk. Next, pour a scoop of MFF Advance Whey Protein into the liquid and shake it for 15-20 seconds. That’s Easy isn’t it… Just follow these few simple steps to get perfect tasting shake. 9. What effects should I expect from taking Advance MFF Whey protein 80 during my daily training routine? Our Advance MFF Whey Protein 80 is made from uniquely collected high quality ingredients and also provides a very high level of protein percentage in every scoop of this product you consume. Results of talking protein vary for every individual depending on individual fitness goals, body type, diet, nutrition, and training. For an athlete, bodybuilder or individuals into fitness it can help to reduce the muscle breakdown, improve workout recovery time and repair broken muscles tissues faster after post workout. 10. Who should take benefits from taking Advance MFF Whey Protein 80™? Our products are meant for every individual who is into fitness, sports, or bodybuilding. We always keep our products information so transparent that customers can completely learn about the product before buying them. Anyone below in this category can take this product. 11. How much Advance MFF Whey Protein 80™ should I take? Daily requirements of protein intake totally vary from individual to individual. It depends on your, body type, height, sports activity, the intensity of workout and your personal needs based on many other factors. But on an average basis for individuals into fitness it is recommended to consume 2-5 servings per day. You can also read our complete Protein Research into “Protein University” Section of “knowledge Hut”. 12. What are the side effects of taking Advance MFF Whey Protein 80? Protein source in Advance MFF Whey Protein 80 is purely from milk. There is no side from taking Whey protein that we have heard of until now. If you are not restricted to dairy products or not allergic to dairy proteins due to any medical reason, then consuming it should be fine for you. Please consult your doctor before consuming any kind of whey protein, if you are allergic to dairy proteins. We also not recommend taking it as the sole nutrition and skipping the meals completely. You can make a good balance and consume it regularly until required. 13. 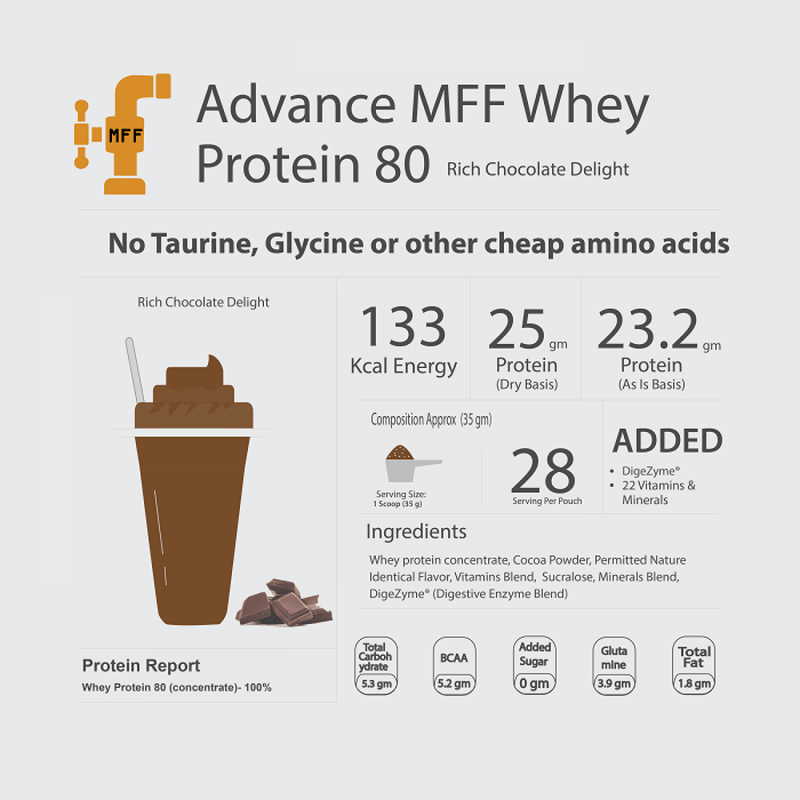 Is there any artificial color or flavor used in your flavored product variant of Advance MFF Whey Protein 80? Solubility of products is not that much good. You dont get that much good taste of vanilla creme in this product. MFF whey 80 is better in these two things than advance mff. Totally satisfied. I was sick of all duplicate brands i have tried before, finally a brand that genuine and delivers as promised. I ordered unflavored version tastes like hell as its unflavored like natural but you get used to it within few days. Had heard about MFF for a long time, so decided to give it a try. Ordered ADVANCE MFF WHEY PROTEIN 80 (Rich Chocolate flavour). The delivery and packing was spot on . The Whey itself seems pure and it mixes well with water. I have been using it for over a month now and it definitely is effective. Its cheaper than other Whey products in the market but in no way does it compromise on quality. The only drawback i would say is the taste. This particular Advance Whey MFF 80 has only 1 flavour !! The rich chocolate flavour really doesn't taste good at all. It tastes like a combination of cough syrup and some tonic people use to ease digestion problems. I hope MFF looks into this flavour. I will be trying the MFF Whey protein 80 next time as they have a variety of flavours . Besides the taste, i am truly satisfied with the product and the results can be seen in about a month. I knew My fit fuel from the time they have entered the market, but being an Indian brand, I had always avoided it. Reading such positive reviews about their product, I felt i should atleast try it once and a month back I bought 6.6 lbs 80 percent protein. Initially i wanted to buy 100 percent but looking at the variety of ingredients in 80 % whey, i ordered the same. The taste is not that great (may be because it does not has much of sugar), but if you add less water then its just fine. The most surprising thing was the post workout recovery ! Guys i have always used original Ultimate Nutrition 100 % whey but always had that soreness in my muscles, BUT with this product the recovery is really good and the protein does its job. Even after working very hard i dont get very tired. Apart from these it also has lot of vitamins including biotin which is good for your hair and essential if you workout heavy. Thank you for this great product. Please dont compromise on your products for profits. Very effective and good taste.